It’s the last Sunday of the month and Community Bible Church is filled with volunteers and community members, all happy to see one another. Everyone is greeted with a warm smile as they take a seat and enjoy a hot meal together, while volunteers begin gathering food orders from the pantry. Community Bible Church is located in Rootstown, a rural community in Portage County, where nearly 14 percent of the population struggles with hunger. 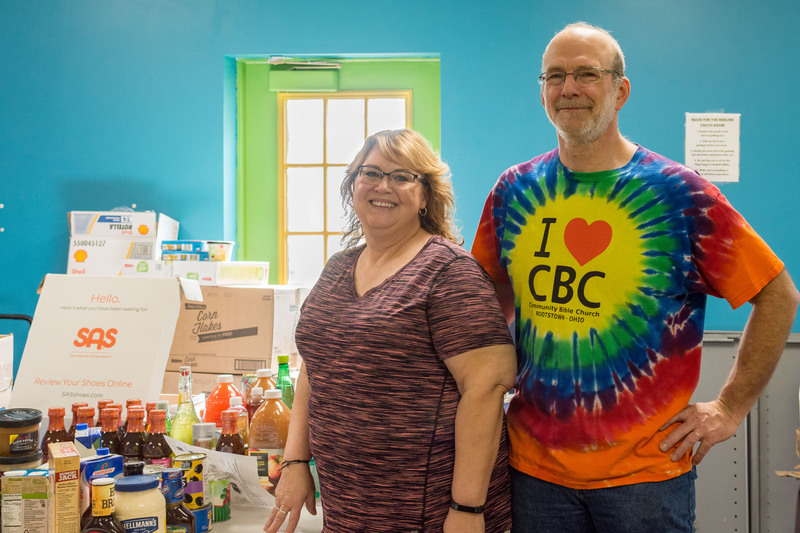 Although the church has provided food baskets around the holidays for many years, it wasn’t until they partnered with the Akron-Canton Regional Foodbank, that the program truly began to take form. In 2008, former church member Holly Flowers created a food pantry after seeing opportunity to expand the church’s outreach services. It was a natural fit, considering her husband Dan Flowers’ role as president and CEO of the Foodbank. Current food pantry coordinators Mitch and Darlene Lambert just celebrated the program’s 10th anniversary in October. “I hope they feel comfortable to come in. We’re here for anybody in any situation,” said Mitch. When asked about the need in Portage County, Mitch described the variety of circumstances that bring people to the pantry. Although they serve a large number of senior citizens living on a fixed income, they welcome a lot of families with children as well, and no two stories are the same. In addition to providing groceries, the church runs backpack programs at several local schools in the area and offers a hot meal at each pantry distribution. Thanks to community support and its partnership with the Foodbank, Community Bible Church hopes to distribute more than 50,000 pounds of food in 2018, the equivalent of nearly 42,000 meals.